Faber-Castell - Gel Stick School Pack - Premium Art Supplies For Kids (20 Sets of 12 Colors) (240 Count). This is a brand new: Faber-Castell - Gel Stick School Pack - Premium Art Supplies For Kids (20 Sets of 12 Colors) (240 Count) School Packs are perfect for classrooms and large groups, these larger sets contain plenty of supplies to engage a larger group. Heavy weight storage boxes have compartments for easy sorting and storing. 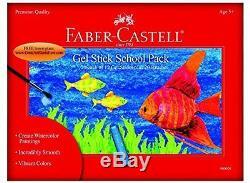 Faber-Castell Gel Sticks are packed with pigment that dissolves with water. Gel Sticks slide on smoothly with rich, intense color. Great on watercolor paper, canvas, paper mache - even wood! - Faber-Castell Gel Sticks are packed with pigment that dissolves with water - Gel Sticks slide on smoothly with rich, intense color - Great on watercolor paper, canvas, paper mache - even wood! Is only relevant for this item: Faber-Castell - Gel Stick School Pack - Premium Art Supplies For Kids (20 Sets of 12 Colors) (240 Count). We do not accept P. BOXES -PLEASE PROVIDE A PHYSICAL ADDRESS. The item "Faber-Castell Gel Stick School Pack Premium Art Supplies For Kids 20 Sets of" is in sale since Thursday, July 21, 2016. This item is in the category "Crafts\Art Supplies\Drawing\Pastels". store" and is located in US. This item can be shipped to United States.